Happy Thursday friends! 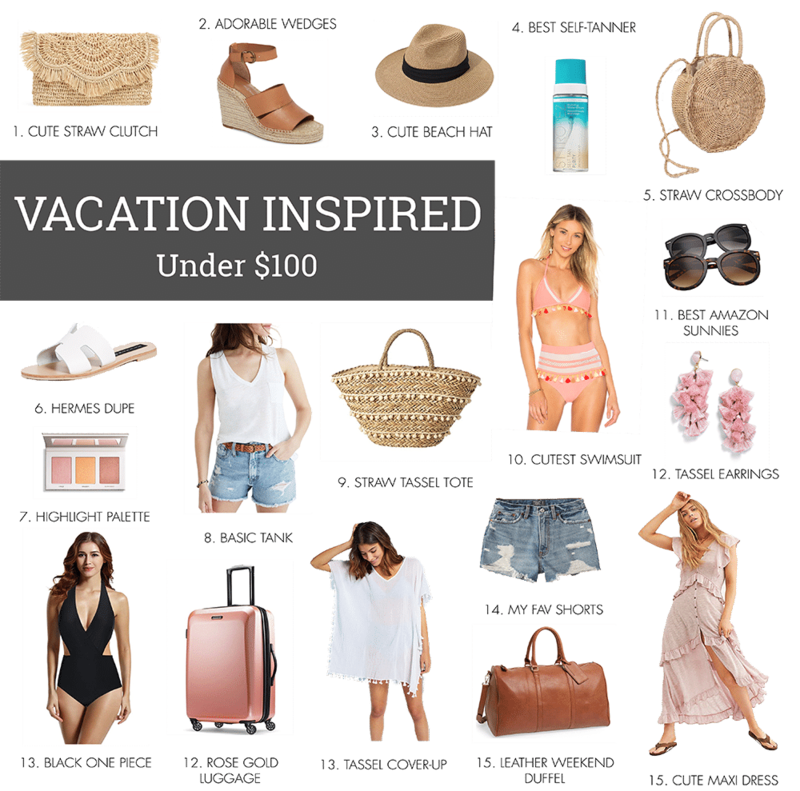 Today I’m sharing some Spring 2019 Vacation Inspired Favorites Under $100 with you guys! 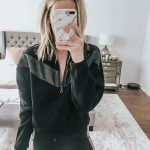 I’m just starting to shop for our upcoming trips this year, and thought I would go ahead and share some of the favorites that I’m purchasing for myself as well! 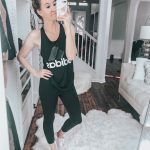 I’m sharing the link and why I love each item down below! CUTE STRAW CLUTCH: I saw this browsing the Nordstrom website and fell in love! This would be perfect for a night out on the beach!! It’s $49 and comes in pink and yellow as well! 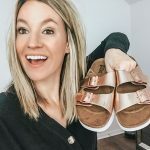 ADORABLE WEDGES: I bought these last year and they are my favorite dressy wedge sandal! They are $75.95 and come in 6 colors including black and white! BEACH HAT: This beach hat from Amazon would be so cute with a tank and shorts or an adorable maxi dress! I’m linking a similar straw hat below from L.Space if you want to splurge on a good quality hat! BEST SELF-TANNER: St. Tropez is my go-to self-tanner in the sunny months! I like that it goes on clear and the scent is horrendous like others that I’ve tried. My self-tanner face drops are currently out of stock, but I’m going to link for when they come back! STRAW CROSSBODY: I’ve been recently dabbling into the Shein website lately and came across this adorable round straw crossbody! It’s perfect for the vacation days spent walking around doing touristy things and shopping! And it’s only $17!! HERMES DUPE SANDALS: These are the BEST dupes for the Hermes Oran Sandal! The price is a fraction of the originals and honestly, I think they are cuter! I’m also linking a similar style from Sam Edelman down below if you’re looking for a brown color! BC HIGHLIGHT PALETTE: I’ve been using this highlighter palette for a while now and I’m OBSESSED! It adds such a glowy look and its made with clean ingredients! I’m also linking my other favorite Beauty Counter sunscreen down below! BASIC TANK: Madewell has some of the best basics and this tank is one of them! It can be paired with shorts in the summer or layered up in the winter! It’s only $18.50 and comes in more neutral colors! I have my normal size small! STRAW TASSLE TOTE: I came across this tote on Amazon and it’s ADORABLE! This tote is perfect for beach days or a place to put toys and snacks if you’re traveling with kids! It’s only $34 which is cheaper than some of the other straw tote bags I have seen! CUTEST SWIMSUIT: This swimsuit is a bit of a splurge but the Tularosa brand is so worth it and it will last you forever! And how cute are the tassels and fun colors! I’m also linking the same swimsuit in black down below! BEST AMAZON SUNNIES: I’ve shared these sunglasses previously and they are my favorite Karen Walker dupes! I like to bring cheaper sunglasses on vacation so that if they get destroyed it’s not a big deal! TASSEL EARRINGS: Everyone needs a fun pair of earrings when they’re on vacation. I LOVE these because they are so lightweight and don’t hurt your ears! They also come in 5 colors! BLACK ONE PIECE: You can’t go wrong with a black one piece! I love this one because it’s from Amazon! ROSE GOLD LUGGAGE: You can’t go anywhere without a good luggage set and this one from Amazon is adorable! The price is so good and I’m linking all the sizes down below! TASSLE COVER UP: Cover-ups are a must when you’re on vacation! You can just put it on after the beach and not feel uncomfortable in your swimsuit! Love this one because of the cute tassels! I’m linking similar options below! LEATHER WEEKEND DUFFEL: This duffel is perfect for a weekend trip to the beach! It holds so much stuff and even comes with a crossbody strap! CUTE MAXI DRESS: This is the perfect maxi dress for a spring vacation! It can be paired with dressy wedges are styled with basic flip flops! It could also be used as a cover-up! How cute are these items! Cannot wait for the spring and summer months to get here already! Enjoy! Ok, I need a vacation to wear all of these things NOW! I love the cheap finds you listed for vacay mode — the straw bag is perfect and the frilly pom-pom suit has my name written all over it! !